Hello there and how were your New Year’s Celebrations? I’ve spent every moment since the night of the 30th until now, horribly sick. The fact that I’m back here clack-a-lacking at the keyboard is a testament to how I’ve recovered just enough to sit upright again. It’s too easy to think of this illness as the bad omens of 2016 following me into the new year so I’ve decided to take being sick as a cleansing so I can start the new year afresh. 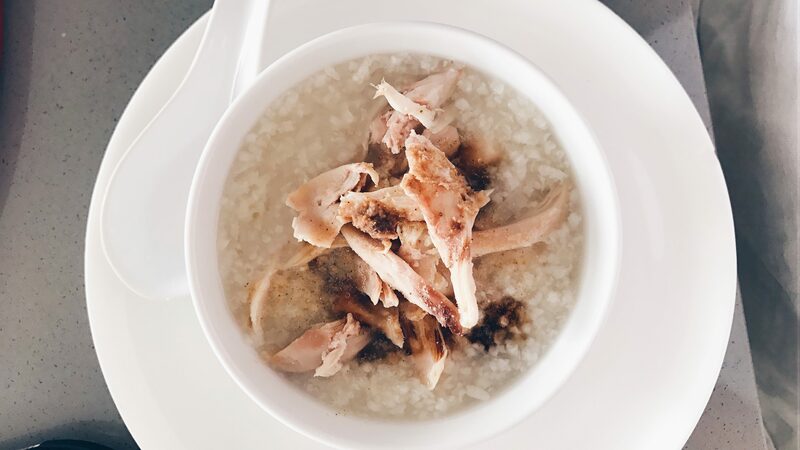 Falling sick isn’t fun at all but when life gives you lemonade, you can make chicken broth congee with the help of your incredible best friend who not only doctored you throughout New Year’s Eve but also drove you home, did your groceries with you and helped you make the said congee. I love congee, especially the ones you can order at yum cha. The texture of the congee you get there is usually really smooth and not too thick or thin, or ‘just right’ as Goldilocks would say. I used to make congee a lot in my first few years of university because it was too easy to throw everything into a pot and let it cook itself plus also so affordable. I would go all out and make the chicken stock from scratch and add in all my favourite things like mushrooms and dried seaweed. This time round I could barely stand up to cook so this is my super easy cheat method for when you too are thoroughly incapacitated but still desperately need a hot, homecooked meal. As per Asian cooking tradition, I basically made enough to feed a small village so feel free to adjust the amounts below. The amount of liquid I specified should yield you a rather thick congee. I would normally add quite a bit more water or stock to it as I like my congee runny. Adjust to your preference. Once cooked, dish out into bowls and top with shredded chicken, sesame oil, white pepper and soy sauce. The last three are super important and I would never skip them! I don’t think I’ve done a recipe in years and yes, this is so easy that it barely counts. I definitely think mastering the basics of congee is super essential for being an adult (while I try to still figure out what that means). It’s really simple food but simple is what you need to allow the body to reset and just feel better.